The life and times of an undergraduate. Over there is my house! Today I attended the second forum of this academic year. This time the meeting followed a more conventional format with officials making speeches and being asked questions. Our guest speaker was Ian Aylett, leader of the scheduling team. Somehow, it is always the timetabling that is a student’s predominant grievance. Some of my colleagues complained of having large gaps between early and late lectures, requiring them to sit idle on campus for much of the day. Others protested at having blocks of more than four hours consecutively. Mr Aylett showed us the inner workings of the timetabling software, Scientia. Released in 1995, this program is older than most of the undergraduates – indeed, older than the county. A new package is due to be released a few years from now, so the current design is not set for much improvement. 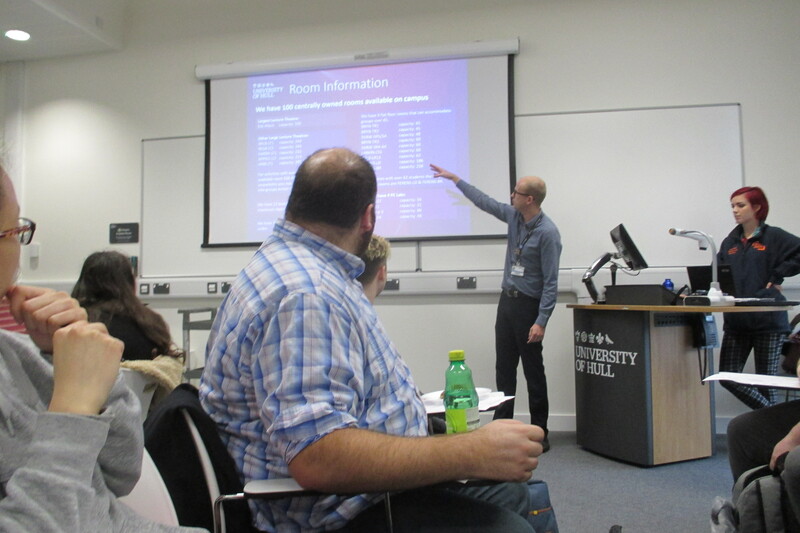 Students asked why the lecture timetables and examination timetables had to be delivered by separate services. The formal conduct of the session briefly dissolved as a few of the computer science students told those present of how they could synchronize the Scientia timetable with their Google Calendar. To assist this, they directed us to a helpful post on InfinityFlame, run by their classmate (and, coincidentally, my long-ago school bus companion) Aidan Crane. The next segment of the forum concerned assignments and the student hubs. Several of the members present were displeased at having multiple deadlines on the same day – a gripe which some of my own constituency have also made. The hubs remain controversial. Several months ago the union held an ill-publicized referendum on reverting to the old department system, but it was invalidated by poor turnout. Tales were relayed to us of students going to their respective hubs and not getting answers. Those dissatisfied with the hub system were keen to see another referendum held immediately and reforms pushed through before the students with knowledge of the prior system aged out of the electorate. That done, President Hall showed us a selection of newspaper headlines and made sure we were informed of national issues regarding higher education. In particular she highlighted the fierce competition between institutions for new undergraduates and a warning that some universities were on the brink of bankruptcy. In a more positive development, she reported that her campaign to increase students’ printing allowance had been successful. The next proper forum is scheduled for February, though there will also be a Christmas event in two weeks. The date for the next student-staff forum is not yet known. This entry was posted in University and tagged subjectrep by Robin Stanley Taylor. Bookmark the permalink. © Robin Stanley Taylor 2015-2018. Many of my photographs (generally not including people) are released on Wikimedia Commons, otherwise this content is All Rights Reserved. Some graphics have been borrowed from others.